Every lost a master key? Every had that floor-dropping-from-under-you feeling while sitting in a chair on the phone? Master keys are necessary, they are also, truly, the keys to the kingdom of any property. Losing a single master key costs time and money. Immediate action is required. The exposure can be tremendous. How many master keys do you have out? Where are they- each and every one? Does each key have “Do Not Duplicate” stamped in it? 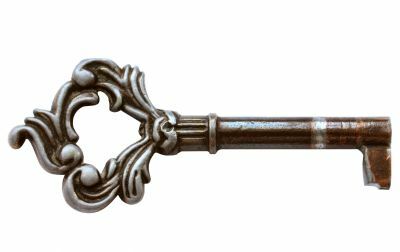 Is there a plan in place for loss of a master key? A few years ago my parents purchased a small Midwestern farm house. At this closing the new owners were informed that in the last thirty years the doors were never locked, therefore, they had no keys. Did I mention this was a country house? There is many a hundred year-old house in Europe with keys like those in the photo above. For most of us, we have keys from manufacturers like Diebold, MasterLock, Schlage, Weslock, Yale, Weiser Locks, Sentry and American Lock. Fission technology may replace gasoline as our primary power source in the future. But when? Like gasoline based products in use for transportation, we may still be using brass keys twenty-five years from now, but they will represent the minority. Technological advances in locking “systems” are becoming less expensive and easier to install. Earlier this summer I had cause to have an over night stay in a town of less than five thousand people. There was one motel in town. It was a thirty year old property- but it had brand new electronic card key locks on every room door. Today most of us have a single key that opens all locks on property. Most of us are now, and into the foreseeable future stuck using fourteenth century technology- a real master key. Ugh. Ok. Let’s get over the shock and try to make some progress here. Silicon Valley is working on your future keys today. Future keys, or entry systems, will have components that include voice recognition, eye or fingerprint scans. Consider that in the future a small set of servers will process and maintain perhaps a billion “keys”. We will have keys that unlock doors and open windows based on pre-programming or “presence” (read facial recognition) similar to how motion lights work today, but with military technology upgrades a thousand times smarter than your current smart phone. Professor Gary Shilling was recently asks about changes to commodities prices and their impact on the greater economy. He stated: “Price changes in commodities are cyclical. A poor crop is almost always followed by a good crop. But remember, just one hundred years ago nearly fifty percent of the population was engaged in agriculture, now it’s less than one percent”. Locking systems are in transition. The futurist Michio Kaku was asks in a recent interview if all this “futurist stuff” was really possible. His response was: “one hundred years ago rapid transit was when your wagon was not stuck in the mud and mass communication was yelling out a window” (American Way June 2012). Ask yourself, before Google, how did you find a plumber? I think fifty-years from now your Locksmith will have a degree in computer intelligence and a masters in Security Systems. Until then, be artfully careful with “my precious” with the underlying responsibility to “first do no harm”.